Children can get close to animals to feed and pet them, an experience that is entirely new to many. Itoman City Tourist Farm was reopened as ‘Uchina Farm’ on Oct. 30 after having been closed since June 2014. The farm opened originally in 2005, and was best known for Acerola Wine it produced but, besides a park golf field that was mainly used by a small group of local retirees, saw continuously diminishing number of visitors and was finally dissolved last year. Mini pigs are cute, friendly and always eager for petting. 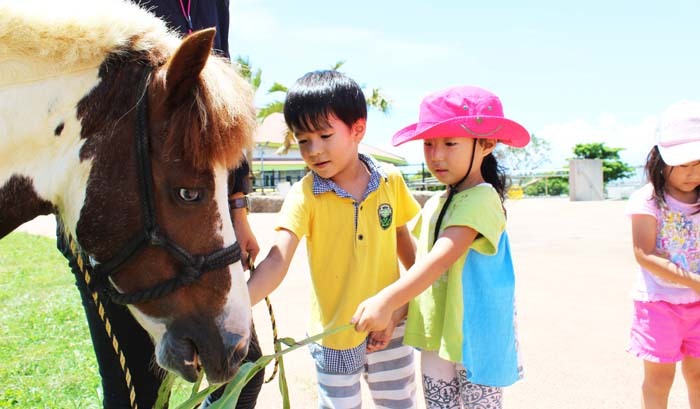 Now the farm has been given a new lease on life, as it was resuscitated as a facility where visitors can interact with some 20 kinds of animals by petting and feeding them. A private company now operates the farm instead of Itoman City that used to own and run the facility before. The Uchina Farm boasts the only zebra on the island that visitors are able to pet. Other animals in the petting zoo include mini pigs, rabbits, kangaroos and sheep. A water buffalo pulls a passenger cart on a route that at one part takes the visitors through a pond. The farm’s winery has also been renovated with a new full-scale brewing system. In the winery, visitors can see the process of making and bottling of fruit wines of the season. 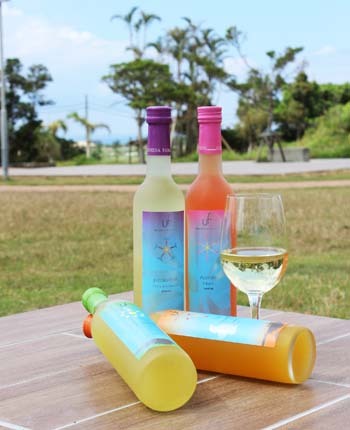 The winery produces refreshing passion fruit and acerola wines with sweet tropical flavor and also juices. Four different kinds of wine are produced; passion fruit, acerola, mango and shiqwasaa, all made with 100% local ingredients. A tractor pulled cart takes people on a 15-minute tours around the farm making frequent stops along the route. The service if currently free of charge. In the athletic area, people from adults to children can use equipment like stilts and pogo sticks for free. Future plans include introducing a vegetable field where people can participate in harvesting local vegetables. A tractor bus takes people on a 15-minute tour on the facility. The service is currently free and the bus stops at points along the route, which has earned plenty of good comments from visitors. The farm produces and sells its own acelora and passion fruit wines, and also juices. The facility also has park golf equipment, mountain bikes and Segway scooters for rent. 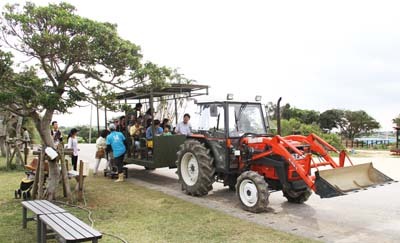 The farm is located at, Mabuni, Itoman City, just across the road from the Okinawa Peace Memorial Park. Their telephone number is 098-977-2793, and it’s open 9:30 to 17:30 every day except on Wednesdays when it’s closed. 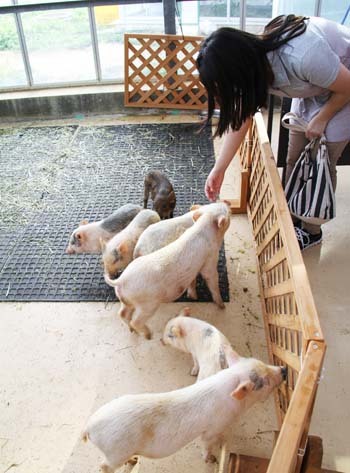 Admission to the facility costs ¥600 for adults and ¥400 for children from four through elementary school age. Children under four years of age are free. Residents of Okinawa get a ¥100 discount on the entrance.